While Wednesday will remain mild and pleasant, Thursday will be cold and windy with snow likely by Friday morning. After Tuesday's persistently soggy and yucky weather, we deserve a nice day! And Mother Nature will deliver, as weak high pressure takes control of New Jersey's atmosphere on Wednesday. Morning temperatures are above freezing across the entire state (mostly in the 40s), so icing issues are moot. Additionally, a dense fog concern has turned into "no big deal" as a little breeze has kept the air stirred up. The lowest visibility observation I could find in New Jersey was 2.5 miles, which isn't bad at all. Wednesday's high temperatures are expected to climb to the mid 40s in North Jersey to the lower 50s through Central and South Jersey. My gut is leaning toward more sun than clouds overhead. Again, a nice early January day. You'll probably notice an increase in wind speed by Wednesday afternoon. After sunset Wednesday evening, that wind will begin carrying colder air toward the Garden State. While Wednesday will probably end up 10+ degrees above normal for early January, thermometers will take a tumble to below-normal by Thursday. Overnight lows will fall to the lower to mid 20s. Even though winds will lighten a bit overnight, a light breeze of 10 to 15 mph would be enough to push wind chill ("feels like") temperatures into the teens for Thursday morning. 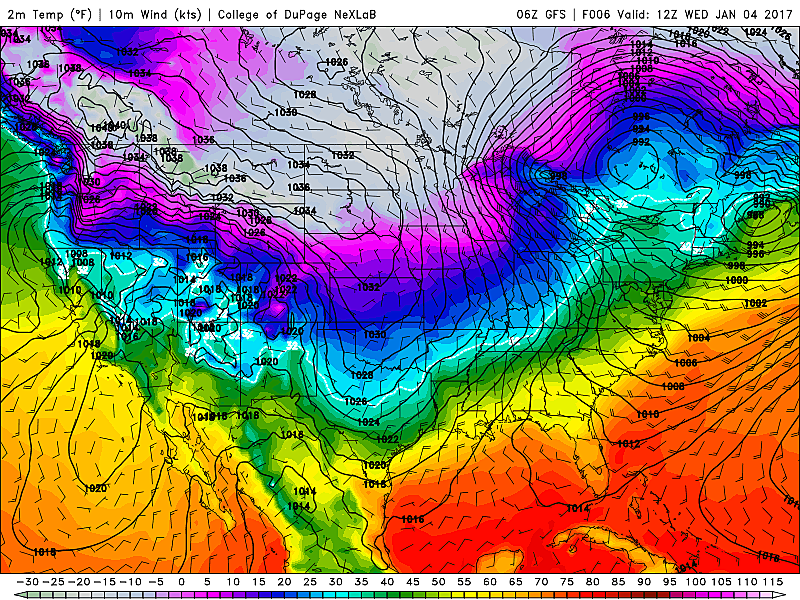 The refreshed cold air will be an unwelcome houseguest here in New Jersey through early next week. The coldest days will be Sunday and Monday, when high temps may not climb out of the 20s. Brrr! With this newly refreshed deep pool of cold air in place, as our next storm system arrives late Thursday night through early Friday morning, we'll see some snow. 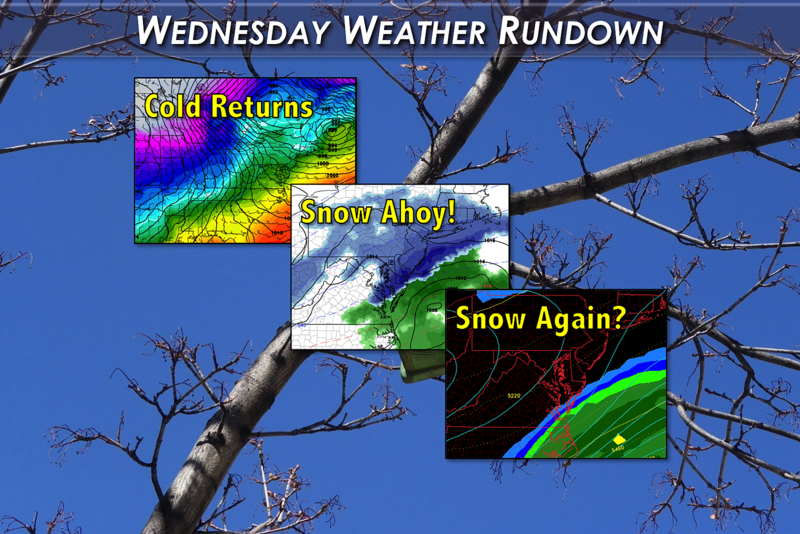 Just snow - no complicated "transition to rain" or "wintry mix" forecast this time around! SETUP: This storm system in question will eject off the North Carolina coast on Thursday night, before sliding up the Atlantic seaboard through Friday morning. It'll just be a glancing blow for New Jersey, but enough to provide a period of light to moderate accumulating snow. TIMING: Snow showers may begin as early as Thursday late afternoon. The "main event" period of heaviest accumulating snow will occur between midnight and 8 a.m. Friday. Snow showers and flurries may linger through Friday mid-morning. TOTALS: New Jersey's southern coast (Ocean, Atlantic, and Cape May counties) are forecast to see the highest snow accumulations from this system, on the order of 2 or 3 inches (at the most). Areas south and east of the New Jersey Turnpike could pick up over an inch of snow. And models are leaning toward a potential coating to an inch of fresh snow stretching into interior central and maybe northern New Jersey too. CONFIDENCE: Although confidence is high regarding precipitation type, this "glancing blow" storm track does add moderate uncertainty to the forecast. How close will the center of low pressure pass to the Jersey Shore? The closer it is, the more likely we see 3+ inches of snow. If the storm ends up a few miles east of forecast, we could end up with only an inch of snow. Or less. IMPACTS: To be clear, this is a minor snowstorm. Having said that, especially given the early morning timing, 3 inches of snow would be enough to cause some driving difficulties and maybe spur a few school delays Friday morning. And it's probably enough to make South Jersey break out the shovel for the first time this winter season. We're tracking a second snow chance, in the Saturday night time frame. In Tuesday's weather blog post, I said this system "looks stronger, but also a bit further south (farther away from NJ)." That description holds true. The GFS says it's a total "miss" for New Jersey. The Euro model says it would be a "hit". So there's certainly reason for concern: Depending on the exact storm track, this weekend's snow threat will be feast or famine - I'm thinking we'll either see zero snow in New Jersey, or 6+ inches of snow for part of the state. Best chance of accumulating snow will once again be in South Jersey and along the coast. There remain A LOT of question marks about this system. And I'm thinking we need to get past Friday morning's snow to get better resolution on the weekend snow threat. Prepare for the worst, hope for the best (whatever that means to you) - as always, we'll provide near-constant updates over the coming days.